Heathrow Airport, Terminal 2A, security search area, March 2015. Heathrow has been awarded Best Airport in Europe amongst airports with over 40 million passengers per year by its passengers. 82% of passengers rated their Heathrow experience as either “very good” or “excellent” in 2016 – a record score. LONDON, 2017-Mar-09 — /Travel PR News/ — The Airports Council International (Global) has announced the winners of the 2016 Airport Service Quality (ASQ*) Awards, naming Heathrow as the Best Airport in Europe amongst airports with over 40 million passengers for 2016. 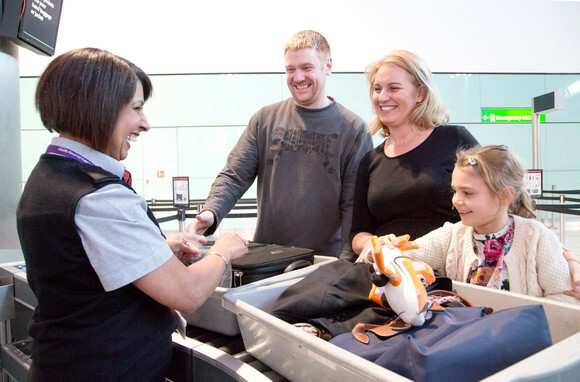 The awards are particularly significant for Heathrow as they are voted by passengers themselves, reflecting the views of travellers from right across the globe. Alongside the award of ‘Best Airport in Europe’, Heathrow achieved its best ever annual ASQ passenger satisfaction score while welcoming a record 76 million passengers through the UK’s hub. “We are incredibly proud to receive this award voted by our most important critics – our passengers. “Our team are continually striving to deliver the world’s best airport service. 2016 was an exciting year for us at Heathrow with the introduction of additional new e-gates making arrivals even smoother across all terminals, the installation of new generation instrument landing systems to improve punctuality in poor weather, a wave of new luxury lounges across all terminals and the opening of Terminal 5’s first ever Personal Shopping suite. 82% of passengers rating their journey as either ‘very good’ or ‘excellent’ represents approximately 62 million Heathrow passengers – an increase of 1 million more ‘happy’ passengers than in 2015. In 2006, only 41% of passengers rated their experience as either ‘Excellent’ or ‘Very Good’. Since then, Heathrow has invested more than £11 billion to enhance the airport experience which has dramatically transformed the airport’s performance for passengers and airline customers alike. This entry was posted in Airports, Travel, Travel Awards, Travel Management, Travel Services, Travelers and tagged Best Airport in Europe, Heathrow, Normand Boivin, The Airports Council International. Bookmark the permalink.